Trattoria Mamma Gina in Florence. A preponderance of more taciturn Americans and multiple rooms help keep this place remarkably quiet for an Italian restaurant—an impression the spare decoration only adds to. But this can only help you concentrate better on the well-prepared dishes, from cannelloni Mamma Gina (prosciutto, ricotta, and spinach stuffed into thin pasta crepes, swimming in melted cheese) or gnocchi verdi al pomodoro (spinach gnocchi in tomato sauce). 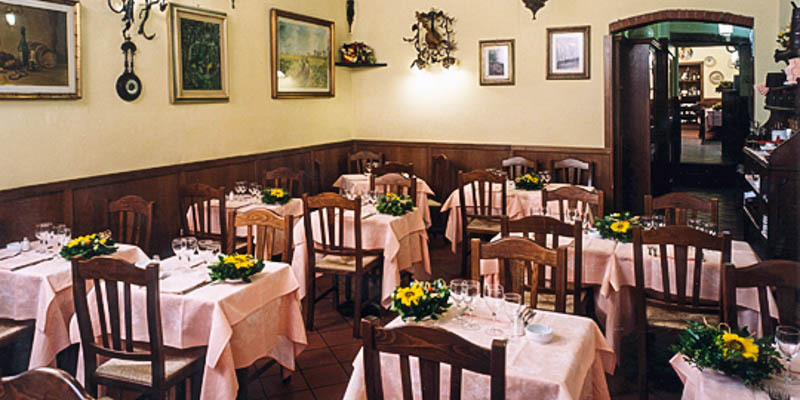 For the more adventurous, they offer Florentine tripe and several preparations of cervelli (brains) as secondi, or you can stick with something more classic like scaloppine di vitello al limone (veal lightly flavored with lemon) or the less refined but tasty salsicce alla griglia con fagioli (grilled sausage with Tuscan beans). "Pane e coperto" is not a scam: Nearly all Italian restaurants have an unavoidable pane e coperto ("bread and cover" charge) of anything from €1 to €15—though most often €2 to €5—per person that is automatically added onto your bill. This is perfectly normal and perfectly legal (though a few trendy restaurants make a big deal about not charging it). Even if the menu doesn't say it, ask É incluso il servizio? (ay een-CLOU-so eel sair-VEET-zee-yo)—"Is service included?" If not, tip accordingly (10%–15% is standard). Don't be stingy about tipping, though. If il servizio is, indeed, already included but the service was particularly good, it's customary to round up the bill or leave €1 per person extra—just to show you noticed and that you appreciated the effort. 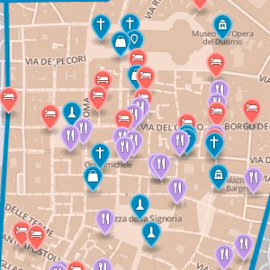 Tourist menus: The concept of a bargain prix-fixe menu is not popular in Italy. Some restaurants do offer a menu turistico ("tourist menu"), which can cost from €8 to €20 and usually entails a choice from among two or three basic first courses (read: different pasta shapes, all in plain tomato sauce), a second course of roast chicken or a veal cutlet, and some water or wine and bread. With very few exceptions, tourist menus tend to live up to their name, appearing only at the sort of tourist-pandering restaurants that the locals wisely steer clear of. However, a menu à prezzo fisso ("fixed-price menu") is often a pretty good deal, usually offering a bit more choice than a tourist menu. Then—especially at nicer (and pricier) restaurants—there is the menu degustazione ("tasting menu"), usually far more expensive (anywhere from €25 to €110) that is a showcase of the chef's best, or of regional specialties, and can make for an excellent way to sample the kitchen's top dishes. Book ahead: For restaurants that I am truly eager to try, I go ahead and book a table—at least at dinner. I find that a corollary of Murphy's Law seems to apply. If you prudently book ahead, you are likely to show up to a half-empty restaurant and feel a bit like a fool for having worried about finding a table. If, on the other hand, you just show up at the door expecting to find a free table, the place will inevitably be packed and its bookings full for the evening. This article was written by Reid Bramblett and was last updated in June 2014.